Bundled up against the elements at the Venice Rotary Arts Festival. On Jan. 20, the club caravanned to the Venice Rotary Art Festival on grounds adjacent to the Venice Airport. We’ve participated in this annual event for many years and this time they had us display our cars up front near the entrance gate, which provided great visibility. We had 16 cars in place by the 9:30 am start time. Historically, the weather at this time of year for this event has proven to be variable. Regular attendees can attest to both extremes: being burnt by the sun in the open, treeless field or “frostbitten” from a strong, chilling wind rolling off the Gulf. The latter was certainly the case this year with the wind so strong that all but one festival vender packed up their tent and left. The result was that instead of an Art and Crafts Show with a bonus of some old cars, we were elevated to the star attraction. But even that ended prematurely when we decided to move our lunch reservations at the British Open Pub up two hours, thus leaving the Festival at 11 am. The festival organizers were obviously disappointed that the club also pulled out of the event early. 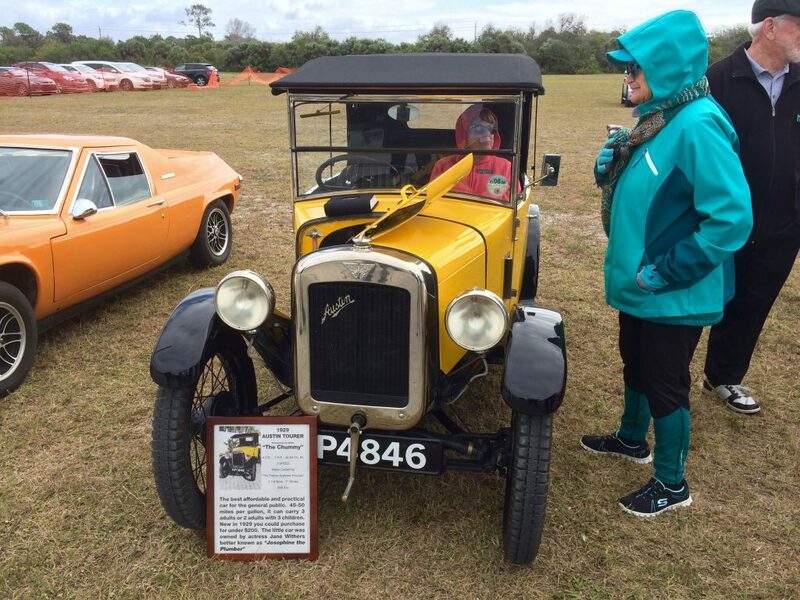 But, as one member wryly observed, “The attendees come to the show to see the arts and crafts venders, not the assortment of British cars present. We are typically the frosting on the cake. No cake, no show!” Twenty members enjoyed lunch at the pub. Input for this report came from Joe Malaney, Bruce Skaggs and Anita Woods. Joe also provided the photos.